The Ace of Wands symbolizes creativity, courage and new beginnings. This tarot card’s most important message is to seize the moment — taking chances will yield exceptional results. The Ace of Wands card depicts a hand reaching out from the clouds, clutching a large, blossoming wand. In the distance we see a landscape, with a castle atop a hill. The clouds and giant hand evoke God, symbolizing the new opportunity that is being offered to you from up high. The blossoming of the wand represents growth and new beginnings, whereas the castle represents success. The hill and mountains remind us of the hard work and courage that is needed to attain our goals. People with Ace of Wands personalities are tenacious, driven and successful — they are constantly pushing forward with new ideas. This drive is accompanied by an individualistic nature. Ace of Wands personalities often think their opinions are the most valuable. As such, it is important for them to stay in touch with their spirituality to remember that success is not the only determinant of one’s worth. An upright Ace of Wands is a highly action-oriented card that is urging you to take a leap. It represents the start of something new and exciting. It’s a great time to take chances as long as you have a positive attitude and are ready to work hard. In a love reading, the Ace of Wands is a sign that you’re entering a new phase in your relationship. This new era will be marked by passion, fun, and excitement, so get ready for an adventure. If you’re single, this card is telling you to summon up your courage and reach out to the person you have your eyes on — at the very least, you should try to go out on a few dates and see how things go. As the card of new beginnings, the Ace of Wands often symbolizes fertility and conception, so it’s good news if you’re trying to have a baby. Your enthusiasm and strong work ethic will pay off as you come up with new ideas. Starting a project right now will enhance your professional reputation, and might even earn you a promotion. A new job may also be on the horizon, especially if you’ve been unhappy with your employment situation for a while. You will be receiving a small, lump sum payment as a gift, inheritance, or lottery winning. Use this money to fund a creative project or invest in your future. The Ace of Wands indicates that you will soon conceive, and that the pregnancy will be healthy and successful. If you are not trying to have a baby, the Ace of Wands may represent the of beginning a weight loss journey. When reversed, the Ace of Wands represents delays, setbacks, and a lack of motivation. Your progress inhibited by feelings of self-doubt, self-sabotage, and a resistance to change. It feels like your life is at a standstill and you don’t know how to get out of it. If you are single or dating, the Ace of Wands is a sign that you are holding yourself back in an effort to get people to like you. This is backfiring as you are never giving them a chance to know the real you. Spend time thinking about what you like about yourself until you feel confident enough to act naturally on dates. The Ace of Wands indicates that people will react positively to you taking this risk. If you’re in a relationship, you may be facing an obstacle that it difficult to overcome, such as infidelity, infertility, or irreconcilable life goals. This has caused you to grow distant from your partner. The problems you are facing have long been simmering under the surface, and it’s time to fully address them. You will be receiving disappointing news regarding your professional aspirations. You may be turned down for a job or promotion. The Ace of Wands can also represent a feeling of boredom or dissatisfaction at your current position. If you’ve been thinking of looking for a new job, push yourself to search for something that will better fulfill you. You’ve hit a wall with your earnings. Simultaneously, your spending has increased. Going into debt has caused you to lose faith in yourself — cut back on spending and avoid risky investments in the near future. A counter to the upright Ace of Wands, the reversed card is a sign of infertility, miscarriage, and difficult pregnancies. It can also represent a lack of motivation to stick to an exercise regimen or diet. Putting in the efforts now will save you from future regrets. 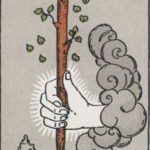 When found in the past position, the Ace of Wands is a sign that you’ve been feeling inspired for quite a while, but you haven’t expressed it yet. Share your passions with the world by creating something real. If you keep tossing ideas around in your head, eventually it will have a negative impact on your work performance and relationships. In the present position, the Ace of Wands means that you are entering a new phase of your life. This transition will come with its fair share of challenges, but you will triumph as long as you are flexible and courageous. The Ace of Wands in the future position signifies that there is a hole in your life that you are yearning to fill. Instead of wallowing in self-pity, prepare yourself for a transformative experience by harnessing the powers of positive thinking and self-care. Ace cards are the trump cards of the Minor Arcana, making Ace-Ace pairings as significant as they are rare. 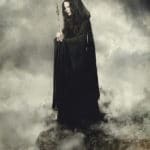 When paired with cards from the Major Arcana, the meaning is generally positive. A new friendship is about to blossom. If you’ve recently started hanging out with someone, keep putting time into your friendship as it will be a long-lasting one. If you haven’t met or reconnected with anyone lately, start an activity or join a group — you’re bound to make a good friend. You have been full of creativity lately and putting your energy into an important project. This endeavor will reward you with money and the respect and admiration of others. Your boldness is going to pay off in the form of a big payday or new, profitable business venture. Continue taking risks and reaching out with others for continued professional and financial success. The Magician acts as a reminder that you are the master of your own destiny. While fate is always present, the choices you make will determine your outcome more than they do for most people. This pairing is a reminder to choose wisely.